15 out of 21 (71.4%) reviewers said they would recommend this vehicle to a friend. I really like the 318i. It was the car that I grew up with and the evolution is not too shabby at all. The styling on the exterior is in my opinion pretty good. When you sit in, the glare of the headlights that tilt up is pretty awesome. Lets you know that you are in for a ride almost. I like the interior of the sports package. The black interior with red stitching, although commonly seen now, really sits in well with the overall theme. The accents of ambient lighting gives it glow just enough to let you know where everything is. The drive is pretty good. I recommend turning off the start stop if you have a guest. It can be pretty harsh. Otherwise, the handling is BMW; And it handles through the ups and downs of a road like it should. There is ample and i really mean AMPLE booth space at the back. While it is not tall, it would fit 2 big ol' luggage just fine along. All in all, a pretty good package from the Bavarians. Lack updates to the ICE system. This ride packs a punch but fails at the looks department both exterior and interior. The boot space and rear passenger seats were much smaller than one would expect. From my personal opinion, nothing against BMW drivers. Been having this BMW 318 for few years ago, hasn't been driving much due to the performance and comfort, which did not really tempt me to drive it. I have driven my F30 320i for more than 2 years before changing to a 528i. My previous car was a Jetta Sports. My 320i was the basic version and there was no navigation, poor sound system and normal seats. Other than these, this car was brilliant in many ways! The engine, although only 181bhp, has good torque and I have never felt inadequate driving on our local roads. The 8 speed auto was silky smooth and didn't have the jerkiness of the VW box. Last but not least, the handling is epic! All in all, a very good buy! The following car , with not much features. Not worth the value been paid for. But is one of the most wanted car by all. Tried the 320 and a 6mth old 316 i feel both are similar with obviously the 320 being more powerful. Very surprised by the cabin sound and the road noise although the interior is good quality. A decent family car with enough leg room and boot space. Test drove the 316 and found it an overall good car but a little short of the BMW benchmark. No comment on the engine reliability as ive not seen any 1.6L turbo worked out well on the engine lifespan. Very lttle signs of the renowned cabin wind noise. Sound insulation as expected for a Beemer of this range. - a little more roll than usual for 3 series? - interior quality not as great as before? Tested the 316i on normal and winding roads. It has great handling compatible with its BMW badge. The new model has stylish exterior. Thought the engine is a tad noisy during acceleration. Good boot and rear space. Its interior could be better, as it looks dated. For business model, its only comes with synthetic leather. Seats are so-so. changed to 19" rim on day 1. changed to washable air filter. stock for all else. reasonable price for a 1.6 litre. 3) Safety features- eg. engine auto off if I leave car; cannot reverse car if door not closed. 4) slightly slow pick up. BMW 3 series, a car which I will only recommend for people who needs transportation, not to extreme comfort and performance. Test drove the 320i. Same engine as the 520i but immediately feels a lot more at home pulling the smaller car around. Engine doesn't feel underpowered as compared to being in the 5. Quick and responsive steering, but not much feel as expected from electric power steering. Almost no body roll in the corners, feels very nimble when switching lanes. Chassis feel tights and well balanced which you can feel if you u-turn quickly. Wheel base is longer than the E90 but still feels easily manageable in terms of the size of the car. 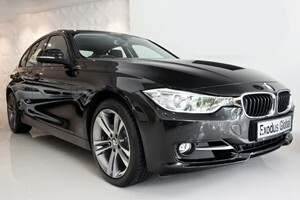 Handles well, accelerates well but the interior could be better as with all BMWs. N20 engine feels most adequately powered in this car. Well sorted chassis gives fantastic handling. Good space in the cabin front and rear. Gearbox is smooth and very fast. Bulbs everywhere. Compared to the c-class, the 3 series looks cheap with the brake lights and signal indicators using conventional bulbs when the c-class uses full LED set up. Stock rims look a bit boring. Interior is functional but not luxurious. The 316 do pack a punch when accelerating for overtakeing car. the 328i's 2L turbo felt very torquey. coupled with the 8 speed auto, it was very quick on straights. the three driving modes were quite instinctive, eg. using it to suit your mood. eco when tired, sport when bored. compared to the 335i, it was not as powerful of course but at 245bhp, not many people use it all up. exhaust note for the two were very different. both had the distinctive growl but the 3L turbo sounded much better. handling was great, the steering light, heavier in sport. interior was fine. seats were comfortable, dashboard with sat nav quite user friendly. only downside was the aircon wasnt quite that powerful. Gotten the 316i business for 3 weeks now. Compared to the 5th generation 3 series, it has looks much more beautiful and sporty, especially the rear lights. The knee room for the rear passengers are also much more spacious and perhaps comparable to the 5 series or 7 series. Frankly I can't tell the difference in space when sitting in the rear seats. The boot although supposedly big (480L), I don't feel it's practicably so as it's deeper but narrower. Also the space is saved from the where the spare tire is usually kept so becomes another additional small compartment to keep things. I need to lie my stroller oblique now compared to just lying it horizontally across in my old car. The price is pretty high and if you add some extras it is really expensive. Handling was not to bad but in the wet you can loose a little traction if you push around a corner. Styling is not that special if you copmare some of the other expensive cars that compete against the BMer. It is a BMW after all. Doesnt have a sporty feel. Authorised Distributor BMW cars are BMW 1 Series Hatchback Reviews, BMW 2 Series Active Tourer Reviews, BMW 2 Series Active Tourer Plug-in Hybrid Reviews, BMW 2 Series Convertible Reviews, BMW 2 Series Coupe Reviews, BMW 2 Series Gran Tourer Reviews, BMW 3 Series Sedan Reviews, BMW 4 Series Convertible Reviews, BMW 4 Series Coupe Reviews, BMW 4 Series Gran Coupe Reviews, BMW 5 Series Plug-in Hybrid Reviews, BMW 5 Series Sedan Reviews, BMW 6 Series Gran Turismo Reviews, BMW 7 Series Reviews, BMW i3s Electric Reviews, BMW i8 Coupe Reviews, BMW i8 Roadster Reviews, BMW X1 Reviews, BMW X2 Reviews, BMW X3 Reviews, BMW X4 Reviews. Parallel Imported BMW cars are BMW 2 Series Active Tourer Diesel Reviews, BMW 2 Series Gran Tourer Reviews, BMW 2 Series Gran Tourer Diesel Reviews, BMW 3 Series Plug-in Hybrid Reviews, BMW 4 Series Convertible Reviews, BMW 4 Series Coupe Reviews, BMW 4 Series Gran Coupe Reviews, BMW 5 Series Sedan Reviews, BMW 5 Series Sedan Diesel Reviews, BMW 5 Series Touring Reviews, BMW 6 Series Gran Coupe Reviews, BMW 6 Series Gran Turismo Reviews, BMW 7 Series Reviews, BMW 7 Series Diesel Reviews, BMW i3 Electric Reviews, BMW i8 Coupe Reviews, BMW X1 Reviews, BMW X2 Reviews, BMW X3 Reviews, BMW X3 2011 Reviews, BMW X4 Reviews, BMW X5 Reviews, BMW X5 Diesel Reviews.